Everything that we know about dinosaurs has been worked out from their fossils. 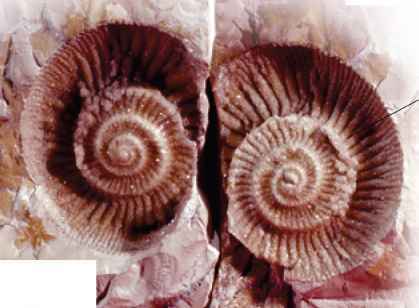 Most fossils are of tough teeth and bones, which have been buried and gradually turned to stone by minerals replacing the once-living tissue. This usually happens under water, so fossils of sea creatures are much more common than fossils of land animals like dinosaurs. 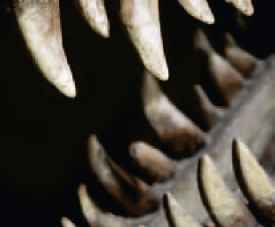 Many dinosaur species have left only fragmentary fossils, such as a few teeth or the odd leg bone. It is also very rare for soft tissues like skin to be fossilized. 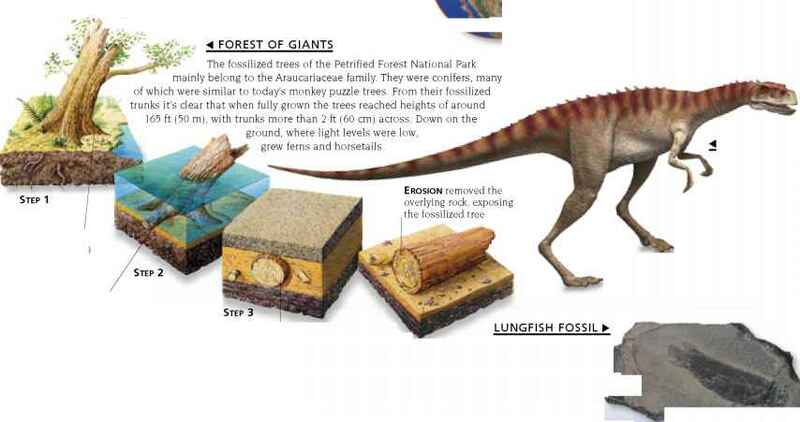 So the "fossil record" is incomplete, and many details of dinosaur anatomy are unknown. 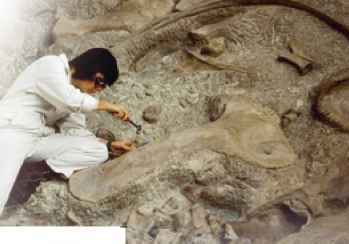 Fossil dinosaur bones are usually surrounded by rock that must be carefully chipped away during excavation. Sometimes the rock is softer than the fossil, and some fossils found in deserts can be exposed by simply brushing away the sand. But excavating fossils from hard rock takes days of painstaking, detailed work. U WHAT IS A FOSSIL? A typical dinosaur fossil is the result of the animal's dead body being buried in wet mud before it could be scattered and destroyed by scavengers. The flesh usually decays to nothing, but the skeleton may survive long enough to be preserved. It may harden into stony fossils, or the mud around it may become solid rock that retains an impression of the bones. 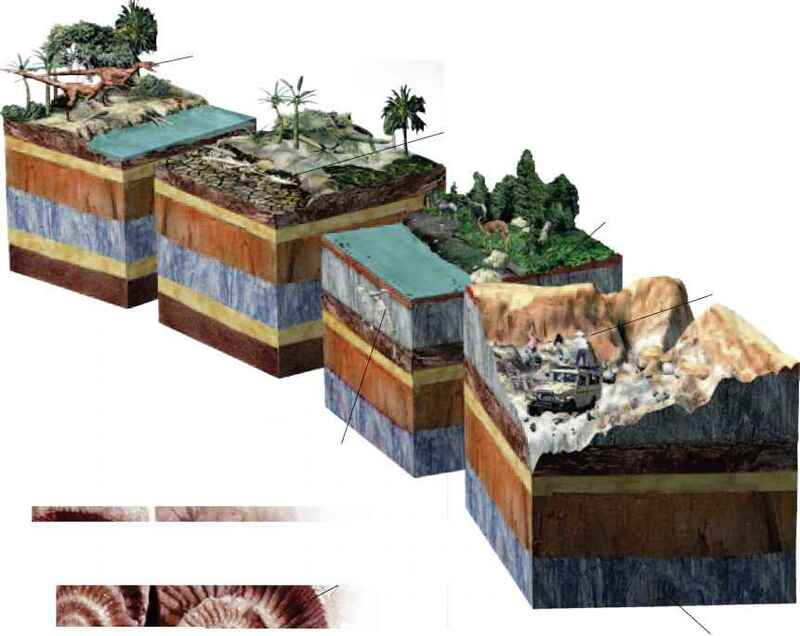 Most animal and plant remains are completely destroyed before they can be turned into fossils. But sometimes the mud that surrounds a buried organism hardens so quickly that it forms a perfect mold of its shape. As the hard mud turns to stone the original organism disappears, leaving a cavity in the rock. This may fill with another material to form a cast.